Bulk wine sourcing, from Chile and Argentina. We use our know-how, network and strategic local information to assist world bulk wine buyers to find and design their wine according their price and quality requirements. At your request we will design the ideal wine blend for your market. Over years of working with local producers, we have developed and excellent relationship that allows us to make the best out of their different batches. We taste their batches for you, select the best ones and those which suit your needs, and blend them in order to create your next award winning wine. 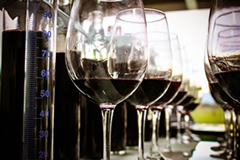 We will help you define how your wine should taste, design the ideal product, and find it. With our technical support, you can be sure that you will obtain QUALITY and CONSITENCY. We will share our knowledge and local presence in order to find the best products for your market. Chile and Argentina have many different climates, varietals and soils: they offer altogether a wide enough range of products to satisfy your needs. We are professional blenders, and we will use our skills and long term experience to create the best wine according to your requirements. Probulkwine © 2019 | Your Strategic Wine Source. | Load: 2.5 ms.